L’Aventura arose from the Brazilian heat and the French romanticism. This is the history of Sebastien Tellier’s fantasy childhood in Brazil, arranged by the local cult figure Arthur Verocai. A wild mixture of love, dreams, sun and landscapes. The recording produced by the artist took place between Paris and Rio de Janeiro during the year 2013. These adventures brought him into Jean-Michel Jarre’s, Bernard Estardy’s, and Philippe Zdar’s (Cassius/Phoenix) studios. Zdar who knows so well how to make the French music sound internationally sublimates the ten tracks of this album, in halfway between the elegancy and the required level of a maestro and the immediacy of a popular song. 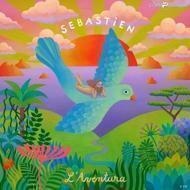 This sixth opus was composed and writed by Sebastien Tellier. For the first time of his career, all the lyrics are written in French. Gainsbourg is not far, like a tutelary figure, Christophe as a springboard, who lets him more space to express himself, and Lucio Battisti, the Italian made him understand that singing in his native language was possible. L’Aventura is a record of shores stretching in an everlasting restart. Naive art carried by an openheart and childish vision of the creation, close to his classic Sexuality (2008).